We united our lives in marriage on August 4, 2007, at Cinnamon Bay on the US Virgin Island of St. John. We chose the date of our wedding ceremony in honor of our parents. Jeff and Sue Domer celebrated their 33rd wedding anniversary on August 4th, which is the day after Bob and Sharon Fasbinder were married 44 years ago. Just moments after we were wed with our toes in the sand, we took our first steps as husband and wife toward our sailboat reception and sailed off into the sunset with 34 of our dearest friends and family members. After an incredible evening on the sea, complete with tropical drinks and a Caribbean feast, we topped the evening off at a beach bar. We are so thankful we had the opportunity to spend a few days relaxing and having fun with all of our guests. It was an amazing feeling to bring so many of our family and friends together to celebrate with us and create memories to last a lifetime. 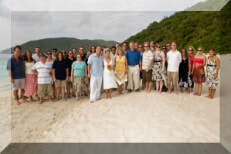 ​As we had a simple wedding ceremony and our main intent was to celebrate and enjoy the island with all our guests, everyone in attendance was a part of our "wedding party". There may be few times in our lives when we have the opportunity to bring our friends and family together, so it was an amazing feeling to see everyone bonding and having fun together. 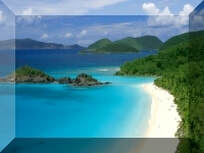 St. John, the smallest and most idyllic of the three US Virgin Islands, is best known for its dozens of postcard perfect white sand beaches, turquoise bays abounding in colorful corals and rainbows of tropical fish, and endless vistas of green velvet hills. Only nine miles long and three miles wide, two thirds of the island is the Virgin Islands National Park, which protects the island from overdevelopment and keeps the population at about 4,000 year-round residents. 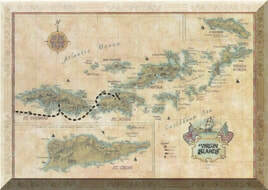 The local culture is an eclectic mix of West Indian and American, and locals speak English, often with a Creole accent. Although the US dollar is used throughout both the US and British Virgin Islands, driving is on the left side of the road. 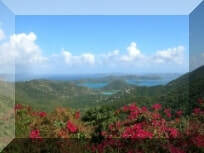 Both water and land activities are in abundance on St. John, with over 30 beaches and 14 National Park hiking trails. It is not uncommon to see wild roosters, donkeys, cows, and sheep roaming public places. St. John is the peaceful, uncommercialized paradise of island fantasies. We went island hopping in the Caribbean the week after our wedding, making stops on the islands of Jost Van Dyke, Tortola, Marina Cay, Virgin Gorda, Scrub Island, and Saba Rock. We traveled to French Polynesia in September for part two of our honeymoon, visiting the islands of Bora Bora, Moorea, and Tahiti. We stayed in a glass-bottom bungalow over the water in Bora Bora!